There are a few different cocktails that use the name rock lobster. You can choose from a banana-heavy blended drink, a whiskey highball with raspberry and cranberry, or a couple of fun party shots. They're all quite tasty and there's sure to be a rock lobster for any mood you're in. The frozen rock lobster is a delicious blend of fruity flavors. It's very tropical and features two types of rum; coconut rum is blended into the drink and dark rum is floated on top. The fruits include banana (liqueur and fresh), pineapple, orange, and pomegranate. This is a fun frozen drink for your summer blender adventures and it's a good one to play around with. If you like a little more coconut, add more rum or pour in some coconut milk or cream. An extra shot of pineapple gives it a nice boost and, for a drink that's a little sweeter, ramp up the grenadine. Have fun and make it your own! Pour all ingredients except the dark rum into a blender. Pour into a chilled highball glass. Float the dark rum on top by slowly pouring it over the back of a bar spoon. For many drinkers, "coconut rum" means Malibu. While it is a nice choice, think about exploring your options because there are some great ones available. Brinley Coconut is a favorite for many rum fans and Cruzan, Caruba, and Don Q are good ones to try as well. The list of banana liqueurs available is short because it is not one of the most common flavors for drinks. Look for 99 Bananas Schnapps or Bols Creme de Banana as these are two of the best options. You will find quite a few dark rum options available in any liquor store. It's very common to use Myer's Dark Rum for a float, though you might also give Gosling Black Seal Rum or Whalers Original Dark a try. Any of these can become your go-to floater for tropical cocktails like the mai tai as well. How Strong Is a Rock Lobster? As with all blended cocktails, the ice used into the rock lobster knocks the alcohol content down significantly. On average, you can expect this drink to weigh in somewhere around 5 percent ABV (10 proof), so it's similar to drinking a beer, only much fruitier! If you're not in the mood for the blended rock lobster, you might try one of these. A very popular rock lobster recipe is served on the rocks in a highball glass. To make it, pour 1 1/2 ounces each raspberry liqueur and Crown Royal Whisky, then add 3 ounces of cranberry juice and stir. Any raspberry liqueur will work: Chambord and DeKuyper Razzmatazz are two popular options. The raspberry rock lobster can also be made into a party shooter. There are a couple of unique shots floating around that also go by this name. One is very similar to the highball and mixes equal parts Southern Comfort, amaretto, and cranberry juice. Shake and strain it into a shot glass. The other is completely different than any other rock lobster. This one asks you to layer in equal proportions Irish cream, amaretto, and white creme de cacao. Make sure to float them in that order or the layers won't work. 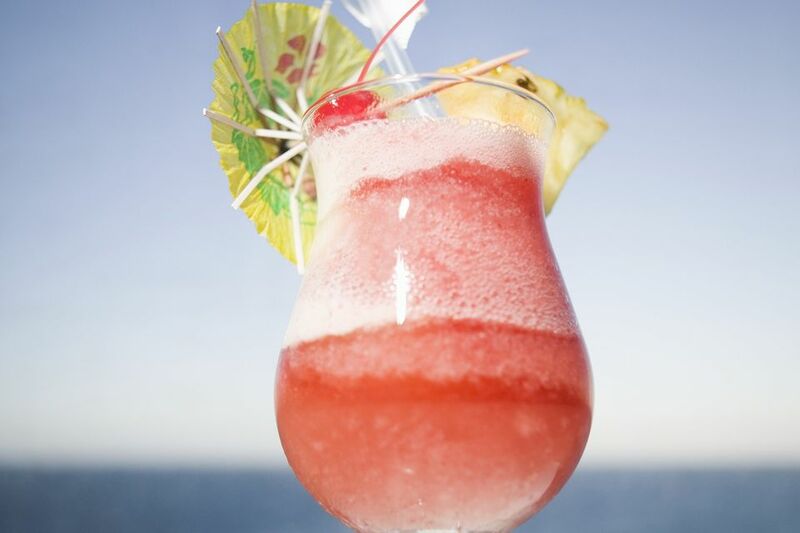 Have You Enjoyed a Taste of the Tropics Lately? Is This Too Much Fruit for James Bond?